Interesting news from the world of aquaculture, as The Fish Site reports on an emerging use of Big Data and machine learning within the aquaculture sector. The health response system being developed by analytics company Manolin aggregates data and quickly notifies farmers when an outbreak of sea-lice is emerging in their region. As with any Big Data project, there are a number of problems that a unified system can solve: there’s too much data available to make proper sense of, it can be challenging to aggregate it from multiple sources on multiple systems, a lot of data is actually on paper, etc. In essence, the Manolin team are developing an automated system to get key information to interested operators much more efficiently. 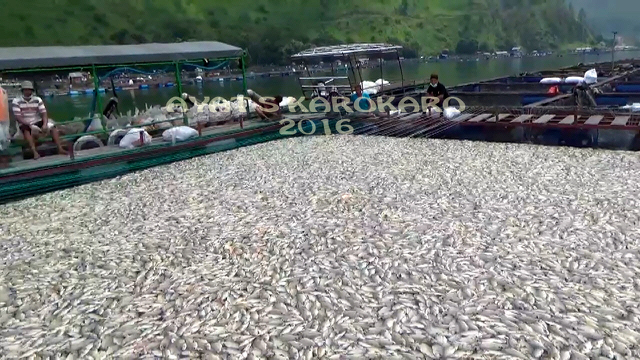 In related news, officials in Indonesia have released a predictive calendar to alert fish farmers in Lake Toba – the country’s largest lake – to the emergence water conditions that have previously killed fish by the millions. The alerts are intended to ensure that fish farmers react positively to worrying signs of water health by, for example, reducing feed amounts that can exacerbate emerging problems. Other recent aqua-tech developments include a Norwegian net-cleaning robot, and using computer vision and machine learning algorithms to support better stock management. The global aquaculture market is predicted to continue to grow healthily in coming years, and with aquaculture tech accelerators such as Hatch (who helped Manolin) emerging, we look forward to many more innovations emerging in the coming months. Aerospace manufacturer Airbus is experimenting with wind power to help reduce emissions and cut costs in moving cargo at sea. The firm uses large cargo ships to move aircraft parts around the world and announced that it would be utilising innovative sail technology to on one of its three roll-on, roll-off vessels. The company hopes that the 5,382-square-foot sail will reduce annual fuel spend by 1 million euros ($1.2 million) and reduce carbon dioxide emissions by about 8,000 metric tons a year. Maersk Tankers announced a similar initiative last month, hoping to cut 7% to 10% of a ship’s fuel use under certain conditions. So hopeful are they of the initiative’s potential that a Maersk spokesman has suggested that the use of wind-harnessing technologies could see wind-assisted companies altering their trading patterns to maximise the wind energy available. Gavin Allwright, Secretary General of the International Windship Association (IWSA), also recently attempted to counter what he said were some of the more prevalent misconceptions about wind propulsion for commercial vessels (it’s an old technology; it’s untested; it’s only suitable for small ships, etc). With Maersk and others hoping eventually for double-digit savings, the results of these emerging initiatives will be worth following. Big news in the world of autonomy, as American company L3 Technologies acquired ASV Global, who boast a broad range of autonomous vessels, and claim to have built over 100 autonomous vessels that collectively have achieved over 1,500 operational days. In other autonomy news, the first Atlantic crossing by an autonomous vessel was also completed this month. Tackling every wind state from calm to a strong gale during the crossing, the SB Met Sailbuoy took 80 days to travel 3,000 km from Newfoundland in Canada to Ireland. Congratulations to all those involved.